A meadow is a field habitat vegetated by primarily grass and other non-woody plants (grassland). Meadows are of ecological importance because they are open, sunny areas that attract and support flora and fauna that couldn't thrive in other conditions. Meadows may be naturally occurring or artificially created from cleared shrub or woodland. They often host a multitude of wildlife, providing areas for courtship displays, nesting, gathering food or sometimes sheltering if the vegetation is high enough. Many meadows support a wide array of wildflowers, which makes them of utmost importance to insects like bees, pollination, and hence the entire ecosystem. In agriculture, a meadow is grassland which is not regularly grazed by domestic livestock, but rather allowed to grow unchecked in order to produce hay. A similar concept to the hay meadow is the pasture, which differs from the meadow in that it is grazed through the summer, rather than being allowed to grow out and periodically be cut for hay. 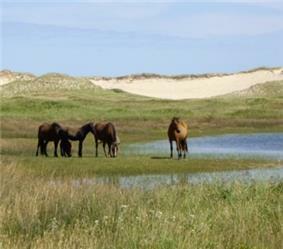 A pasture can also refer to any land used for grazing, and in this wider sense the term refers not only to grass pasture, but also to non-grassland habitats such as heathland, moorland and wood pasture. The term, grassland, is used to describe both hay meadows and grass pastures. 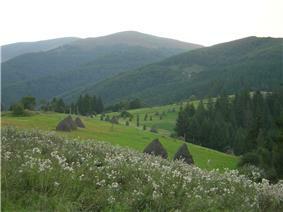 The specific agricultural practices in relation to the meadow can take on various expressions. As mentioned, this could be hay production or providing food for grazing cattle and livestock but also to give room for orchards or honey production. A transitional meadow occurs when a field, pasture, farmland, or other cleared land is no longer cut or grazed and starts to display luxuriant growth, extending to the flowering and self-seeding of its grass and wild flower species. The condition is however only temporary, because the grasses eventually become shaded out when scrub and woody plants become well-established, being the forerunners of the return to a fully wooded state. A transitional state can be artificially-maintained through a double-field system, in which cultivated soil and meadows are alternated for a period of 10 to 12 years each. In North America prior to European colonization, Algonquians, Iroquois and other Native Americans peoples regularly cleared areas of forest to create transitional meadows where deer and game could find food and be hunted. For example, some of today's meadows originated thousands of years ago, due to regular burnings by Native Americans. Many places named "Deerfield" are located at sites where Native Americans once practised this form of land management. 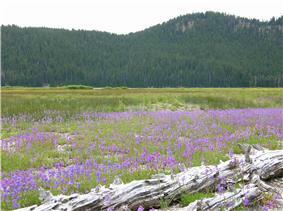 Alpine meadows occur at high elevations above the tree line and maintained by harsh climatic conditions. Coastal meadows maintained by salt sprays. Desert meadows restricted by low precipitation or lack of nutrients and humus. Prairies maintained by periods of severe drought or subject to wildfires. 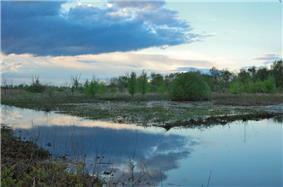 Wet meadows (a semi-wetland area) saturated with water throughout much of the year. Apart from the perpetual meadows, meadows are often conceived of as artificial or cultural habitats, since they have emerged from and continually require human intervention to persist and flourish. It can be argued however, that meadows are really semi-cultural habitats and not entirely cultural. The reason is, that in many places the natural, pristine populations of free roaming large grazers are either extinct or very limited due to human activities. This reduces or removes their natural influence on the surrounding ecology and results in the fact that meadows can only be created or maintained by human intervention. It is true, that in many places, the existing meadows would gradually disappear, if not artificially maintained by mainly agricultural practices, but with a reintroduction of natural populations of large grazers, meadows would again reappear as natural habitats in the landscape. Mankind has influenced the ecology and the landscape for millennia in many parts of the world, so it can sometimes be difficult to see what is natural and what is cultural. This is one example. 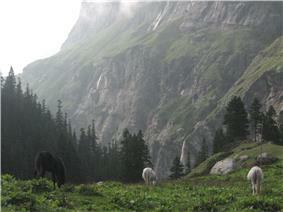 As extensive farming like grazing is diminishing in some parts of the world, the meadow is endangered as a habitat. 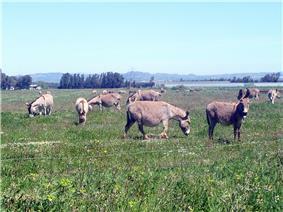 Some scientific projects are therefore experimenting with reintroduction of natural grazers. This could be deer, elk, goat, wild horse, etc. depending on the location. A more exotic example with a wider scope, is the European TaurOs Project. ^ Maryland Department of Natural Resources, "Maryland's Wild Acres." Retrieved June 18, 2013. ^ a b Rebecca Morelle: Conservationists warn of hay meadow decline BBC News Science & Environment, June 28, 2010. Retrieved June 18, 2013. ^ a b Meadow The New International Encyclopedia, 1905. Retrieved June 18, 2013. ^ Pasture The New International Encyclopedia, 1905. Retrieved July 5, 2013. ^ a b Helena Ruzickova and Miroslav Bural, "Grasslands of the East Carpathian Biosphere Reserve in Slovakia," In: Office of Central Europe and Eurasia National Research Council, Biodiversity Conservation in Transboundary Protected Areas, National Academies Press, Sept 27, 1996, p. 233-236. ^ a b Robert Griffiths et al. : Conifer Invasion of Forest Meadows Transforms Soil Characteristics in the Pacific Northwest Forest Ecology and Management 208, 2005, p. 347-358. Retrieved June 18, 2013. ^ Geoffery A. Hammerson, Connecticut Wildlife: Biodiversity, Natural History, and Conservation, UPNE, 2004. ^ T. A. Rabotinov, "Meadow," The Great Soviet Encyclopedia (3rd ed), 1979. http://slovari.yandex.ru/ (in Russian), Retrieved June 18, 2013. ^ A Co-evolution of plants and animals ARK Natuur.